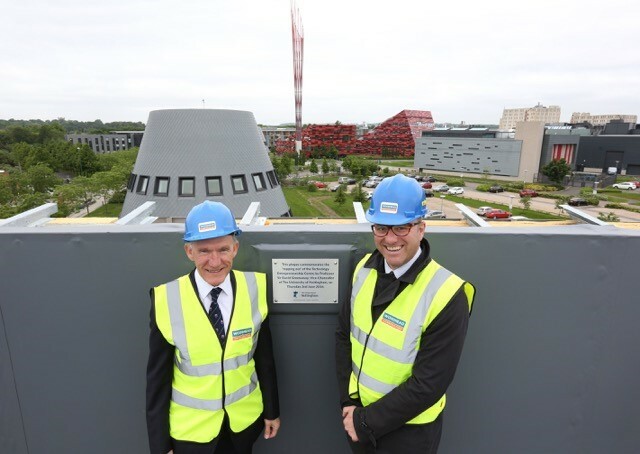 A new centre which will house the next generation of local entrepreneurs has been topped out in Nottingham. The Technology Entrepreneurship Centre (TEC), is a 2,000m2 three-storey building based at the University of Nottingham Innovation Park. As the focal-point of the University Enterprise Zone, it will provide office-based accommodation for up to 50 technology-driven start-up businesses and early-stage SMEs, from the local business community and from within the University. The building is costing £5.2m to develop, half of which has been received from the government as part of the University Enterprise Zone programme. Nottingham is one of only four universities in the country to have been awarded enterprise zone status. Due to be completed in autumn 2016, the TEC Centre will also be the new home of the Haydn Green Institute for Innovation and Entrepreneurship’s ‘Ingenuity Lab’. This is designed to help students develop and nurture entrepreneurial skills that will enable them to thrive as business owners and leaders. It will focus on supporting businesses which operate in sectors of key local and national importance, such as Big Data & Digital, Advanced Manufacturing, Aerospace and Energy. The aim of the Centre is to create 50 new businesses by 2019, generating 350 new jobs and delivering a combined turnover of £25m by 2021.